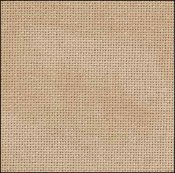 Country Mocha Lugana 32ct  - $53.90 : Yarn Tree, Your wholesale source for cross stitch supplies. Item 2830. Country Mocha Vintage (3009) 32 Count Lugana. 52% cotton/48% rayon. 55” wide. (Zweigart 3984). 32 stitch count. 1 yard cut. Combination of colors in a pleasing mottled pattern. Colors are similar to DMC 842 for the base color and DMC 422 for the swirl color. Please order by Yarn Tree’s item number. [For your reference, Zweigart’s item number and color numbers are in ( )]. All the products sold by Yarn Tree are available wholesale to needlework stores. Standard wholesale discounts apply off prices shown.